The Fed has done an excellent job of preparing the world for this rate hike so it was already built into market prices. Don’t expect much to happen. Some economists expect rising interest rates to kill the “recovery” and plunge the US economy into a recession. And of course the standard Austrian business-cycle theory teaches that rises rates will cut short an expansion. But as I have written before, recessions can happen without rising rates because of the Ricardo Effect. But the idea that tight money is the only cause of recessions, as monetarists claim, is an example of the post hoc fallacy: because recessions happen after several rate increases by central banks, people think the event that happened first caused the one that happened later. It’s similar to attributing the rising of the sun every morning to roosters crowing. 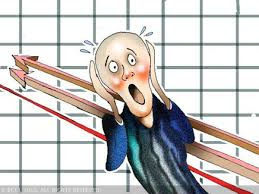 The looming recession will happen because insanely low interest rates after 2008 caused excessive investment in commodities, especially oil, natural gas, iron, copper and even cotton production. That investment was not excessive in the sense that overall investment in the economy was too much, as Marxists have often insisted. It was excessive in the sense that it should have been invested in the production of more consumer goods instead of capital goods, or in different capital goods. Monetary policy launches unsustainable expansions, but the real economy ends them. Mises put it in terms of a house builder who lays a foundation for a 20,000 square foot house. Afterwards, he discovers he has enough material for only a 1,200 square foot cabin. Hayek describes it as the rising costs of production for capital goods producers (due to competition for resources from consumer goods producers) meeting falling demand for their capital goods (because consumer goods producers use more labor and less equipment) resulting in collapsing profits. Lachmann portrayed the turning point for some recessions as hitting a “ceiling,” or shortage of a commodity used for the production of capital goods. That may have happened in 2007 but is not likely this time around with the vast quantities of commodities on the market driving prices to historical lows. Lachmann’s version applies more to recessions that happen at the top of commodity super cycles. According to the media, the Fed thinks that the economy is doing well because inflation has picked up and unemployment is low. However, Fed economists know that employment is a lagging indicator that peaks after the recession has begun, so I’m suspicious that the media have that wrong. My guess is that the Fed doesn’t want to get caught with its pants down when the next recession hits. For investors wanting to ride out the storm, I’ve put some of my funds into closed end bond funds. Closed end funds are like exchange traded funds (ETFs) in that they buy a fixed quantity of bonds. Investors trade the fund as if it were a share of stock. The current advantage to closed end funds is that many are selling at discounts to the value of the bonds in the fund, so it’s a typical value play, but with bonds in a market where there are no good value plays in the stock market. Closed end funds pay interest, plus, once things calm down, the investor should get a boost in the value of his principle, much like the price of a stock appreciating, when investors bid up the price of the fund to the value of the bonds in it. The discount on the funds is proportional to the riskiness of the bonds inside so investors can get a huge discount on junk funds these days. I don’t have that kind of courage. I have my money in a fund that buys medium term government debt, the kind that don’t respond much to recessions or interest rate increases.